Episode III’s Jedi hunting droid gets an airing. 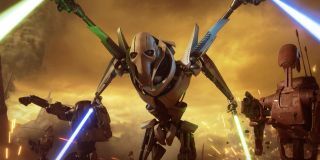 DICE has added General Grievous as a playable Hero in Battlefront II, letting players assume the role of the quadruple lightsaber-wielding droid, defeated by Obi-Wan Kenobi in Revenge of the Sith. As both a warrior and a general, Grievous' three special abilities revolve around a blend of power and tactics. “Thrust surge” sees the general lunge toward an enemy, stabbing with all four lightsabers, while “Claw Rush” enables him to scuttle quickly forward, and can be used for a quick retreat or to knock down opponents in your path. The way the general moves in Claw Rush is also genuinely disturbing, like some chittering hell-crab. The final ability is “unrelenting advance”, in which Grievous spin two lightsabers to form an unstoppable blade wall, blocking all frontal attacks and causing damage to anyone caught by his blades. The general also comes with two different available skins, plus a third that’s yet to be announced along with his own Star Cards, voice lines, and victory poses. The community feedback for Grievous has been generally positive, although some users have complained that the Thrust Surge hit detection is a little flaky, while others wish that his second pair of arms were on display more often.